One of the toniest celebrity addresses in Los Angeles gets its name from what was once an unassuming spring-fed marsh in a far-flung corner of land baron John Lankershim’s vast rancho in early San Fernando Valley. 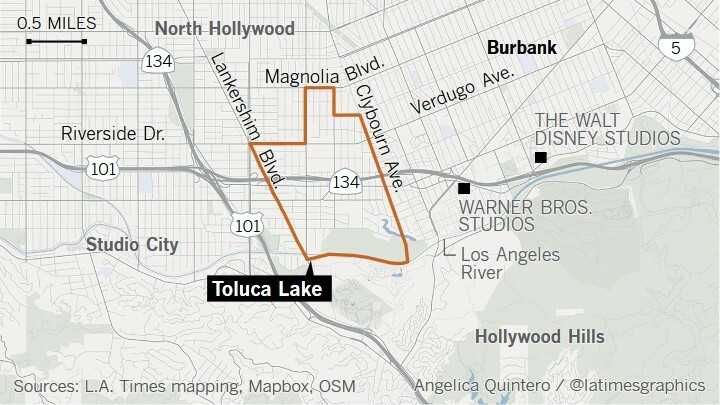 This muddy little lake’s journey to becoming the centerpiece of Toluca Lake, a genteel gated community popular with the Hollywood elite, began when Gen. Charles Forman purchased the land on which it sat in 1889. An industrious pioneer from New York whose exploits included selling Brigham Young the lumber that built Salt Lake City and founding the Los Angeles Cable Car Co., Forman had amassed a huge fortune over the years. Money and common sense being no object, he had once packed up his massive Nevada mansion and moved it at great expense to the corner of Pico Boulevard and Figueroa Street, but as he aged he began looking for a country place where he could while away his golden years as a farmer. The fertile land east of the Cahuenga Pass, with its lake and the nearby Los Angeles River as irrigation sources, was perfect. Soon enough — and no doubt to his dismay — the city followed him out to the Valley, as engineers succeeded in running a trolley line through the pass. Before long, Hollywood studios, hungry for room for sprawling backlots and stages, began spilling over the hill, first with the opening of Universal City Studios in 1915 and later with motion picture mills owned by the Warner brothers, Walt Disney, Mack Sennett and others. The booming popularity of civil aviation also brought development, with three airports and countless manufacturing plants springing up across the Valley. Real estate developers seized on the opportunity to market luxury homes to the stars and aeronautic industry execs, laying out in the 1920s a planned community with a newly manicured, asphalt-bottomed Toluca Lake at its center. Amelia Earhart was among the first to buy in the neighborhood, and soon, other luminaries of screen and sky followed suit. Bing Crosby, Frank Sinatra, W.C. Fields and, most famously, Bob Hope called Toluca Lake home at one time or another, and the neighborhood remains a popular destination for industry types looking for a low-key lifestyle with a short commute. In the late 1940s and 1950s Toluca Lake also became a center of Valley car culture, with a concentration of drive-in restaurants and other car-oriented businesses on Riverside Drive. The street was home to the first International House of Pancakes and today boasts the oldest remaining Bob’s Big Boy in the United States. 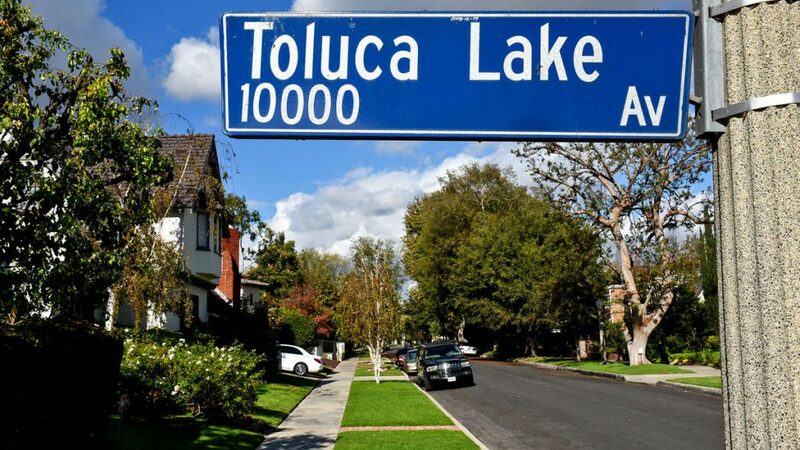 Unseen scenery: It’s stocked with fish and adjacent to the lush greens of the Lakeside Golf Club, but scenic Toluca Lake is kept under lock and key behind a gated entrance, accessible only by residents. A blast from the past: The Bob’s Big Boy parking lot is the site of a weekly classic car show that’s a must-see for gearheads. Welcome to the neighborhood: Toluca Lake’s pleasingly unpretentious shopping district has a definite homey feel and includes one of the Valley’s best Irish bars. Ch-ch-changes: The recent listing of the Bob Hope estate raised fears that it could be subdivided and redeveloped, a situation that could arise again as more estates change hands, potentially threatening the unique, historic character of the neighborhood. Hilton & Hyland agent David Kramer, who earlier this year renovated and flipped a Toluca Lake estate once owned by Bing Crosby, is bullish on the neighborhood’s star appeal. In September, based on eight sales, the median price for single-family home sales in the 91602 ZIP Code was $1.073 million. That was a 53.3% increase in price over the same month the previous year. Within the boundaries of Toluca Lake is Toluca Lake Elementary, which scored 837 out of 1,000 in the 2013 Academic Performance Index. Nearby public institutions include R.L. Stevenson Elementary, which scored 905, and Rio Vista Elementary, which had a score of 898. East Valley Senior High scored 625.